The goal of the game Line 4 is to place 4 pieces in a row vertically, horizontally or diagonally. Here in the lair, the game is played on a square 8x8 board. White wins and place a piece. Then it's black's turn, and so on. - Either on the bottom line. The image below shows a game in progress. 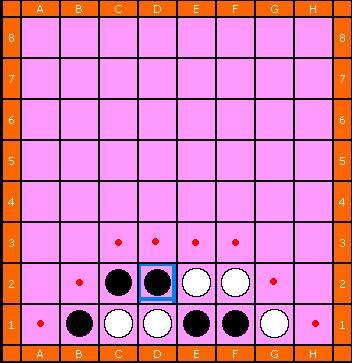 The red dots show the squares on which the player (here, white) can place a piece.